Horncastle Town head to Cleethorpes tomorrow (Saturday) hoping leading scorer Michael Harness can maintain his red-hot form and keep them on the trail of the Sills and Betteridge League title. Harness bagged his 17th goal of the season last week in a 3-2 win against Ruston Sports - a result that moved Town into second place in the table. They will be aiming to add another victory to their tally when they take on Cleethorpes AKP tomorrow. Town are just two points behind leaders Wyberton and have five games in hand. Defending champions and title favourites Skegness Town are in third place. They are level on points with Town (29) and have played the same number of games (12). 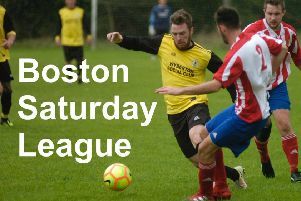 Wyberton visit struggling Market Rasen tomorrow while Skegness are involved in a derby against Skegness United. Town should be close to full strength with midfielder Richard Jackson looking to supply the ammunition for Harness and his fellow strikers. Although Town picked up three points against Ruston, manager Paul Johnson will be looking for an improved display. Town were indebted to keeper Lewis Burchnall who pulled off an outstanding save in the final minutes. *Town’s reserves don’t have a game tomorrow and return to action on Saturday week at home to Birchwood United in the Lincoln League.